The past year had been a struggle for my 15+ year old yellow lab Daisy. This is one of the last pictures I snapped of her in a favorite spot. One of the toughest times for us was the barks in the middle of the night, usually 2am. I would take Daisy out, walk around to her favorite place in the yard and hope she would relieve herself or something, to help her feel better in that moment. When we talked about these walks with our vet I said, “the middle of the night walks aren’t so bad on a clear night. I love gazing at the stars with her”. Our vet and my husband were speechless at my gratitude for those special moments with Daisy. After a visit to the vet where Daisy was diagnosed with pneumonia, I was ready to make a most difficult but sympathetic decision to end Daisy’s struggle. To set her free of boundaries that kept her down. But, my husband and the vet thought with her fighting constitution she just might power through with treatment. I acquiesced. A few days later, while we were out of town, Daisy chose her moment. Winter is hard, cold, a struggle. Daisy stayed strong through most of this one, but succumbed. She sent the message, “Goodbye for now. Thank you for this wonderful life. Thank you for caring “. It broke my heart not to be there with her. The vet FaceTimed with us, and we all prayed as she sent her spirit running off to heaven. My father once said that dogs want to leave when they are near their time. They want to save their person the strife of letting go. Of holding on; too tightly. My childhood pet collie Gypsy did just that. She ran away, and a shop owner found her miles from home wandering the avenue. Dad an I jumped in the car, picked her up, and headed to the vet. His report was bad: kidney failure. Gypsy was 12, and it was her time. I guess looking back on Daisy’s life, if we gave Daisy anything, it was the choice when to leave us. Now, when I see a star filled sky, I see my Daisy. According to Merriam Webster, Erin go bragh means “Ireland forever,” but the original Irish phrase was “Erin go brách” (or “go bráth”) which translates literally as “Ireland till doomsday.” Given the fortitude of most of the Irish I know, the latter fits the comittment to which they give most things they love. And, one of the things in my life I will love to doomsday is my Dad. An Irishman through and through. Born Anthony Daniel Meehan – 6/18/21 – he recited his birthday until the day he died. He may have been a wee bit confused about many a thing in his later days, although never to the extent of an Alzheimer patient, but, 6/18/21 rolled off his lips whenever the question of his date of birth was asked. The smile across his face while reciting this most important information was broader than the River Shannon is long. Today is St. Patrick’s Day. This day we Irish celebrate Ireland’s Patron Saint, who taught the Irish of the trilogy using the 3-leafed Shamrock. Saint Patrick brought Christianity to Ireland during his second captivity in Ireland. Nowadays, we do recognize March 17th to be a holy day of obligation to Saint Patrick. But, mostly, contemporary culture spends the day celebrating the Irish, their food and song, and joviality. And the green – color of The Emerald Isle. So, on this special Irish day, I remember my Dad. I remember what St. Patrick’s Day meant to him. It meant he relished his Irish heritage. It meant he’d dress up in shamrocks and green while he sang songs like “When Irish Eyes Are Smiling” and “Danny Boy”. It meant he joked around speaking in a brogue. It meant we heard stories of his beloved mother, who raised nine children during The Depression, a time with little or no social assistance. It meant we heard stories of his youth – stealing milk from the Dairy farm across from their home on Tiemann Avenue, the Bronx. It meant hearing the tale of his family living in a tent while his Dad – an Irish immigrant from Sligo, Ireland – built the home in which they went on to live. It meant we heard how his Dad was a carpenter that worked on the Empire State Building, and that he had a still in the basement. It meant we heard the stories of my Dad installing tile in Windows on the World in the World Trade Center. It meant we heard about Bosco, my Dad’s dog who was badly burned when my Grandmother spilled boiling water over him, and then the dog was put down. It meant that the tale of his St. Patrick’s Day dinner was whatever was available for his Mom to cook – like a rabbit in the pen, or a chicken in the yard. St. Patrick’s Day meant a world of tales of my Dad’s life were spun and spun, while I listened so very intently so that I might be there in his remembrances to share every last minute with him. Mandatory voting? So much for the rights of the individual, as well as personal accountability. Individual liberty, the foundation of our America, requires the exercise of free will. Democracy is based upon the personal responsibility of citizens to vote, and “get the government they deserve”. To achieve “a government for the people, by the people” the people must be moved by their desire to the selector of the people that make up their government. That inspiration of self-rule cannot be replaced by a command to vote from the government, otherwise the government is in charge of the people. The passion to engage in our government, although a necessary evil, is the target of our democracy. Free people fully engaged. American exceptionalism is built from the bottom up – the empowered, engaged, free citizen. No where else on Earth is there such a gem. Where were you, and what were you thinking today @9:26am? I was on the treadmill – literally and figuratively – and the moment was gleefully recognized by the hosts of a Saturday morning news show. Carpe diem! A once in a century moment, I felt privileged to been watching the moment unfold before me…and what was I going to use this moment for? Well, the Pi moment is a metaphor – for life. Here it is, the one and only life you’ll have. Live it. Stop and eat the pie! Today is historical, or horological if you prefer. 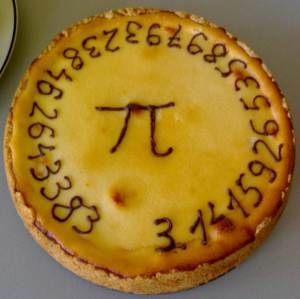 It is a day in which the mathematical representation π aligns with our clock sequence, that is 3/14.